Avere OS’s vservers are virtual fileservers that control how data flows between the client and the cluster’s core filers. Before starting to configure a cluster vserver, read the linked documentation and consult your Avere representative as needed to understand the structure of the Avere cluster’s file serving system. These sections of the Cluster Configuration Guide will help you familiarize yourself with Avere OS’s vserver and global namespace features. When creating a vserver you must supply a single range of contiguous IP addresses, but you can add more addresses later by using the Client Facing Network settings page. A cluster can have multiple vservers. Use the VServer > Manage VServers settings page to create a new vserver. 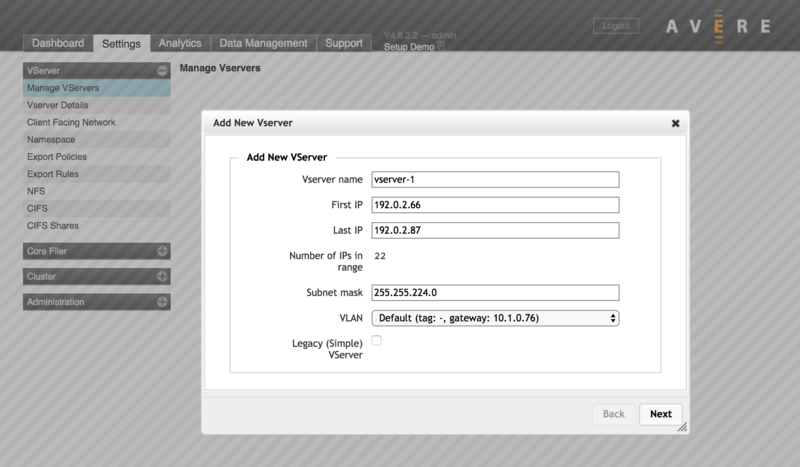 Refer to VServer > Manage VServers in the Cluster Configuration Guide for complete information. A junction maps the backend storage path to a client-visible namespace. You can use this system to simplify the path used in client mount points, and to scale capacity seamlessly because one virtual path can accommodate storage from multiple core filers. Refer to VServer > Namespace in the Cluster Configuration Guide for complete details about creating a namespace junction. After you have both a vserver and a core filer, you should customize the export rules and export policies that control how clients can access files on the core filer exports. First, use the VServer > Export Rules page to add new rules, to modify the default policy, or to create your own custom export policy. 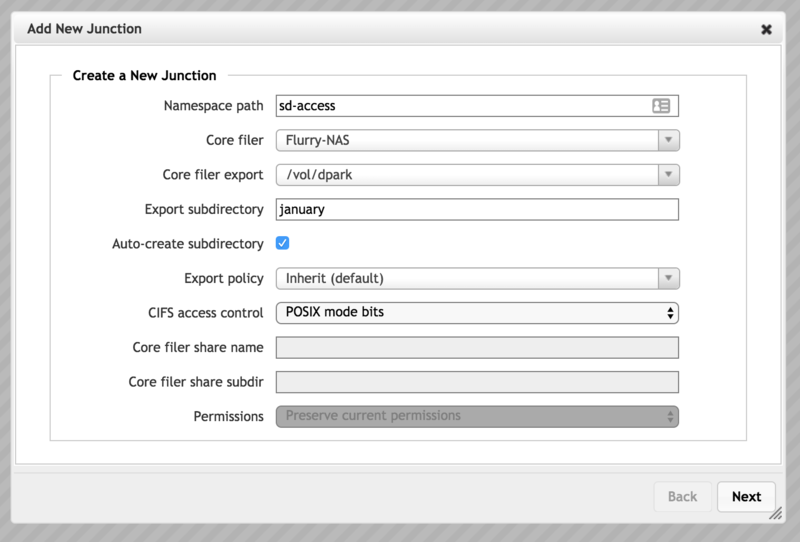 Second, use the VServer > Export Policies page to apply the customized policy to your core filer’s exports when accessed through that vserver. Read Controlling Access to Core Filer Exports in the Cluster Configuration Guide for details.